MODELLAK PROFESSIONAL MODEL VARNISH - C-L Sp. z o. o. Obtaining easy-to-treat, high-gloss model surface, characterized by chemical resistance to release agents and styrene, has always been a problem to be approached in various manners, usually leading to a compromise. Recently new model coat finishing systems for composite moulds appeared, owing to which we may obtain ideal surface prepared for the mould production. A two component high gloss finish on the basis of polyurethane resin and hardener – aromatically modified isocyanate, elaborated especially for the models and moulds. Perfectly evened, easy application of sprayed liquid. Perfect resistance to scratching and soiling. Suitable as finishing paint system for models used for production of moulds in the GRP industry . Perfect adhesion to polyester and glass laminate surfaces, wooden surfaces, MDF surfaces and Poltix putty. Colour and gloss – RAL 1001- high gloss. Practical efficiency depends on many factors such as: shape and size of the surface to be painted, surface conditions and profile, application methods, weather conditions while using the product and employees’ skills. Conditions for surface and temperature of application. All appropriate surfaces: clean, dry, free of any impurities and loose particles, preferably previously fixed with Poltix putties, such as: Poltix Superplamuur, Poltix Spuitplamuur or IJmofix and ground with sand paper. During the application and hardening, minimum temperature of 15°C is allowed. Surface temperature should be 3°C higher than the dew point. 2 — Double Coat Modellak primer system and Double Coat Modellak hardener. 3 — Double Coat Modellak primer system and Double Coat hardener. Application with brush / roller manual method is suitable only for minor spot repairs. In case of bigger surfaces, the Double Coat Modellak primer system and Double Coat hardener should be used. Viscosity regulation by adding the Double Coat Spray solvent: 50 – 55 seconds (DIN). Use an oval brush resistant to organic solvents, mohair or moltopren rollers. Viscosity regulation by adding the Double Coat Spray solvent: 18 – 20 sec (DIN 4). Use a nozzle with the diameter of 1.4 – 1.6 mm. Apply a mist layer as the first spraying, after ca. 15 minutes supplement gradually until reaching complete layer thickness. Do not apply too thick coating in one layer. In case of larger painted surfaces use the Double Coat Modellak primer system and Double Coat hardener in the proportion of 67 parts of the primer and 33 parts of the hardener by weight. This will reduce the risk of occurrence of losses in the processes but the coating will reach optimum resistance to monostyrene after 5 days. 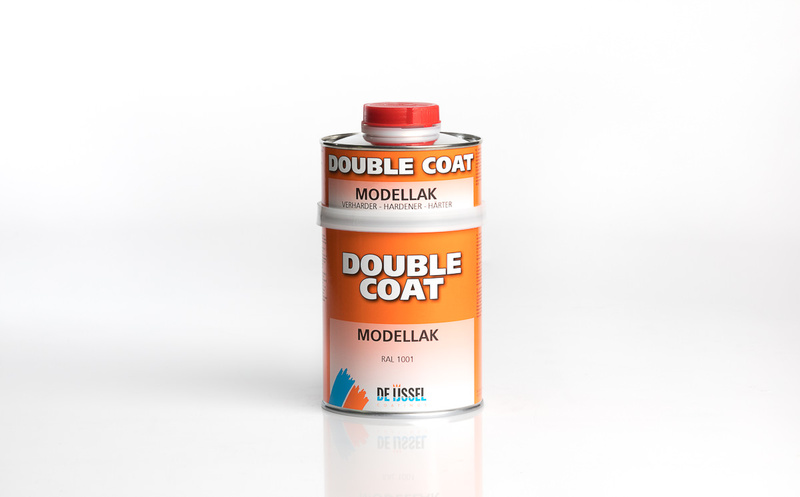 Double Coat Modellak gains the best adhesion when the surface between particular coatings is ground. Very good grinding effect may be achieved owing to grinding with sand paper from P320 to P400. Durester C5806G is a spray tooling varnished based on polyester resin, thixotropic, intended for the construction of models and moulds. The product does not contain wax and is accelerated. It is hardened with the supplement of 1 – 1.5% of the MEKP initiator (e.g. Butanox M–50 or P–50). good resistance to the temperature of exothermic peak. Durester C5806G reaches optimum properties after hardening at room temperature even in case of a thin layer. After hardening, it has hard and glossy surface, easy for finishing treatment by means of grinding with water papers and polishing. All surfaces should be dry. Ambient temperature, surface temperature and product temperature should range from 18 to 22°C during application and hardening. Moisture should not exceed 80%. The varnish is easy to spill on the surface however in case of spraying onto porous surface (e.g. PU foam, MDF), the spray putty primer should be used. It is important for the surface to be free of such pollutants as dust or oil. In such a case the surface should be ground with sand paper P180–240 and wiped with electrostatic cloth. Varnish should be applied with 3 to 6 “wet to wet” layers, with a conventional spray gun. The nozzle with the diameter of 1.5 – 1.8 mm and the air pressure of ca. 2.5 bar are recommended. Acetone or a substitute is suitable for washing of the tools. To accelerate the hardening process, the model may be heated at the temperature of 50°C, when the surface becomes dust dry. Too fast heating may cause closing of air bubbles and porosity. After hardening the surface may be easily ground and polished to high gloss. It is recommended to do it after a few days. Store in a cool and dry place, not exposed to sunlight, in an originally closed packaging. Storage time in such conditions for at least 3 months. Non-accelerated version’s (C5800G) storage time amounts to 12 months. Stir well before use.